It was very difficult to contain my happiness and hide emotion the moment when I saw promos of some Pakistani plays on my DTH at prime time. No I was not dreaming and neither was it cable mismatch. The television software giant and pioneer of digital entertainment in India- Zee TV has yet again revolutionized Indian television and content by bringing a new bouquet of offerings from #SarhadPaar. It is aptly called @Zindagi that will be going on air from 23rd June 2014. I was a huge fan of Pakistani play and binged my heart and soul on the legends like #Tanhaiya, #Ankahi and #DhoopChaon that always shared its sweet smile via the classic videotapes they are stored in. Only I know the Internet bills that I exhausted to watch/download those lovely serials from YouTube and my failed attempts to download from Virus infested Torrent Sites... No more digital Virus anymore, I though. The only thing that going to be viral is - Happiness! I logged on my computer to know more about Zindagi and the serials they are going to showcase. Guess I was looking for those 3 names that formed my formative years. However, this time the names were new and unfamiliar. They were nonetheless inspiring as always like- @ZindagiGulzarHai, Aunn Zara but still unfamiliar that I took it to my social network to find more and see if I can establish the same "connect" with them that I had with the 3 serials that I mentioned above. I saved the date. Distance never matters when two hearts truly care! It was epitomized when Delhi, Mumbai and Karachi got seamlessly connected with each other on same time and could not just see each other but have a real communication, debate and chat at same time without any black outs and interruption. It felt great to see some known faces and blogger friends like Manjulika, Kriti, Neha and other others in attendance. I guess after #India and #Pakistan [largely for cricket matches] MUmbai V/s Delhi is the most debated about topic among the citizens of India. Ewww When Did Delhi Men become Hotter than Mumbai? #Debating Societies. 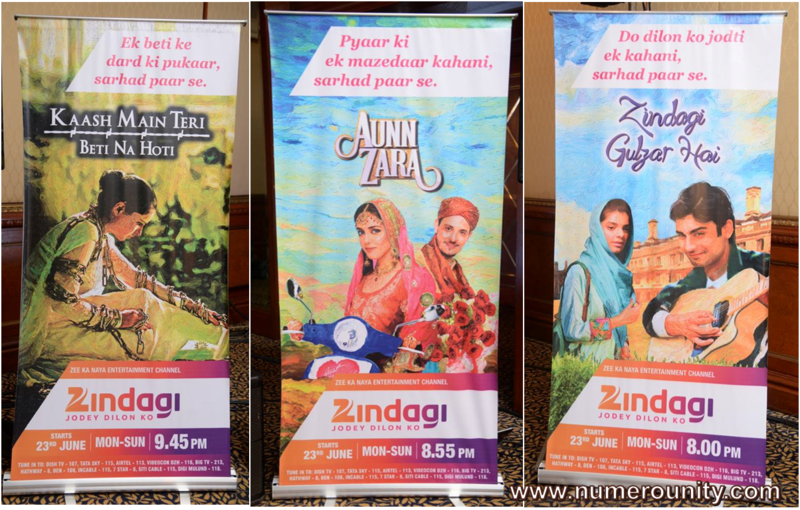 The meet showcased few trailers of the upcoming show on Zindagi TV including the beautiful "Kitne Girahe abhi baaki hai". The promo took my heart away with a perfect blend of symbolic story telling with words like- "Kitni Girahe kholi maine, Kitni girahe abhi baaki hai..Paaon mein paayal, haath mein kangan, gale mein hansli, kamar bandh" poured a different intensity in my heart with an eye feasting visuals of a woman who symbolized these jewelries with her freedom and voice. Brilliant Creativity! When I watch a beautiful thing, say a show or movie, I always feel like meeting and knowing the talented people behind it who brought that beautiful emotion to me, painstakingly. This meet enabled bloggers to meet and interact with the intellect behind the channel and the show that included the lead actor, scriptwriter, director and executives from ZEEL like Priyanka Datta [Business head- Zindagi], Vanita Jain [Head of programming], Akash Chawla [marketing head] and Shailja Kejriwal -Chief Creative Head- Special projects. These talents essays that how stereotypes of Saas-Bahu and regressive content on Indian TV needs a break. Indimeets are always laden with fun and interesting contests and given it's fastest real time speed and response- Twitter steals the show with photo contest and Tweet contest. I was happy to see many of the known bloggers well deserving prizes for their twitter entry and last minute blog posts. A friend even got a MOTO G..how brilliant is that. Team Indiblogger is a delight to interact with. The reason that Indimeets are so well organized and well conducted events is not just one but many. It begins from master blaster Techno geek Renie Ravin to Affable Vineeth, gorgeous Nandita, Sweetheart Swati and ever vivacious, ever spontaneous and one helluva lot of host- Anup Johnson who is beyond agendas and above real time fun. His impeccable sense of humor and harmless bickering with his co host Nihal at Delhi, stole the show. This and much more made #JodeyDilonKo Indimeet an affair to remember and cherish. While some bloggers won vouchers, bag packs and some went empty handed. But none of the blogger went empty hearted and that is what #JodeyDilonKo is all about. Isn't it? I am back home and tuning to my favorite music from Gulam Ali Khan and some gems from Coke Studio including the songs that Fatima, a fellow blogger had earlier sent me from these shows. I feel so connected with them now and they start making much sense than ever. Indiblogger you truly have #JodeyDilonKo with Zindagi, Zee haan!